Every school district has its own points of pride. Whether it’s in the form of displaying student artwork, showcasing the successes of athletic programs or simply creating a school culture, these personal artifacts are what make an educational community as prevalent as they are. Before its recent annexation with Marshall, Albion Public Schools bore a great deal of weight to its name. In addition to being quite successful in their extracurricular activities, Albion felt real success in putting out educated students during a time in which the district as a whole was struggling and the next school year was never guaranteed. Now that the dust has settled and the former Albion schools have adjusted into their first year under Marshall annexation, questions are starting to be raised as to where these Albion points of pride – such as student awards, artwork, murals, and memorabilia – have gone. They no longer seem to be present in the annexed district. At buildings such as Harrington Elementary, artwork, which had been created by students from previous years, had disappeared. At the former Albion High School, the Wall of Fame for the school’s former athletes was bare. Students like Jontaj Wallace II, a first-year student at Albion College who attended the Albion schools until his sophomore year of high school, were initially caught off guard by the disappearance of the artifacts. While the absence of these artifacts is perplexing and discouraging to Albion residents, hope for the preservation of the Wildcats can be found in the words of Dr. Randy Davis, the superintendent of Marshall Public Schools. He explained that items previously showcased in the Albion schools are set to be used for bigger and better projects. In addition to the restoration project, Davis has also talked highly of a grant that has been co-sponsored by the FireKeepers Local Revenue Sharing Board. This grant would help financially support the efforts of this Memorabilia Committee. Whether or not the grant has been awarded is yet to be seen. These efforts proposed by Marshall officials have given a bit of solace to former Wildcats like Wallace. 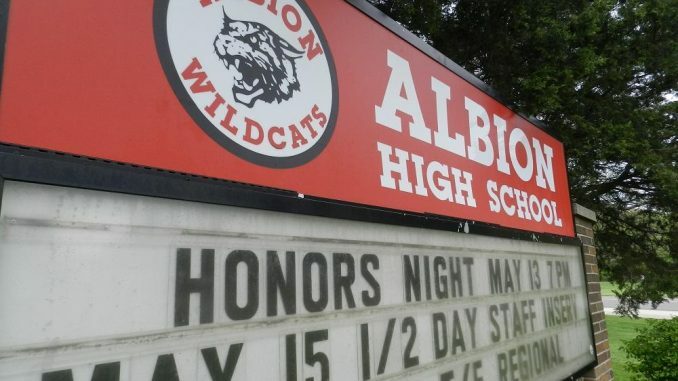 These past few years have been grueling for the former Albion School District, all laced with a theme of uncertainty. However, through the efforts of leaders like Randy Davis in the Marshall Public Schools, the legacy that Albion gave to the overall community are sought to be revived and restored.